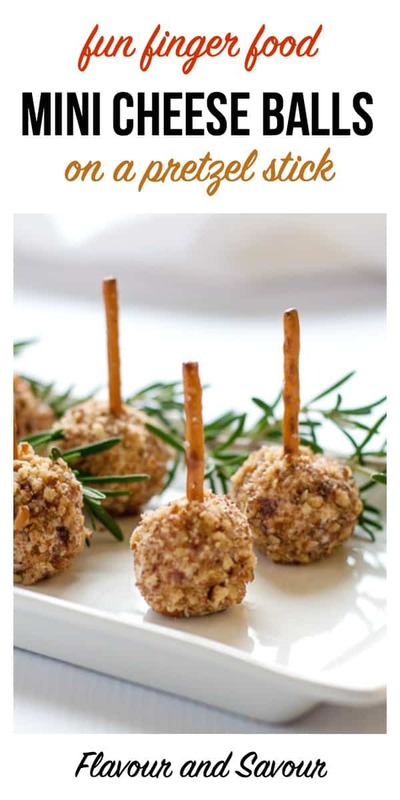 These Mini Cheese Balls on a stick are one of the easiest appetizers ever! They’re a creamy bite perfectly balanced with sharp blue cheese (or other sharp cheese) and sweet cranberries. Perfect for holiday parties. 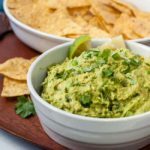 Here’s a quick and easy last-minute appetizer for your next party. 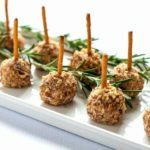 I make these little bite-sized cheese balls often, especially at holiday time, and they are always snapped up! Who can resist tiny bites on a stick? 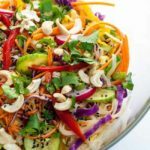 They’re quick and easy to make if you use a food processor and you can make them ahead of time before your guests arrive. Pop in the pretzel stick (use gluten-free pretzels if necessary) just before serving. 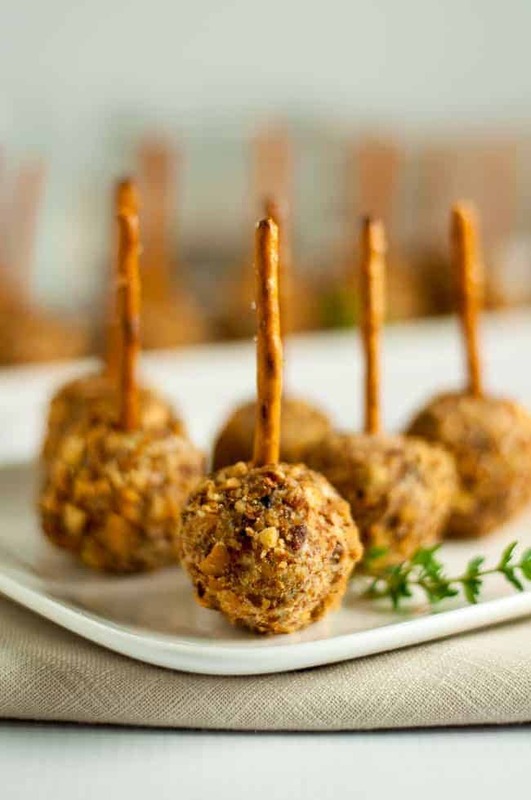 These Mini Cheese Balls on a Stick are so simple to make! Coat with chopped nuts, and refrigerate. Just before serving, push a pretzel or a fancy toothpick in the center and bam! A fun finger food is ready for party time! These cheese balls are one creamy bite, perfectly balanced with the sharpness of blue cheese and the sweetness of cranberries. If you don’t care for blue cheese, substitute another strong cheese, like aged cheddar or a smoked cheese. 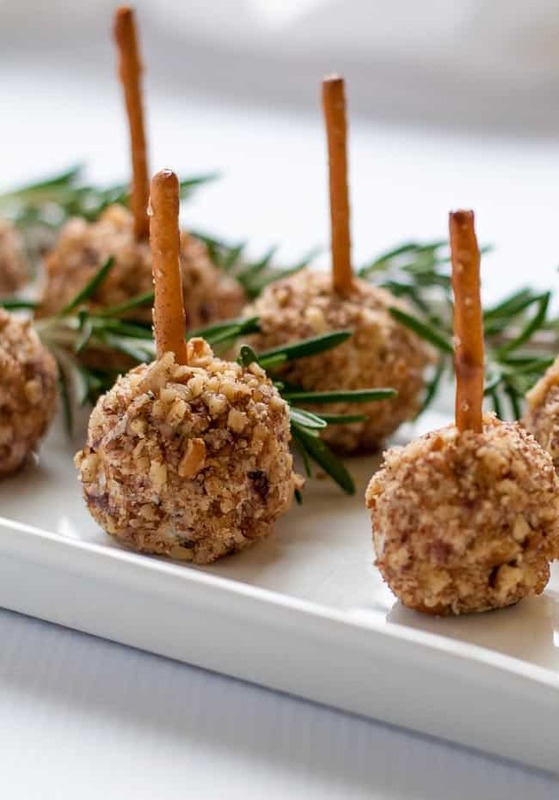 These mini cheese balls are guaranteed to disappear from your appetizer platter quickly. Can I make these bite-sized cheese balls ahead of time? Yes! Combine the ingredients, roll into balls, and store in an airtight container in the refrigerator. These will stay fresh for up to 3 days. Insert the pretzel stick just before serving. Try variations of these cheese ball bites! You’ll love these Mini Cherry Almond Cheese Balls, too. If you can’t eat regular dairy cheese, you might like these Mini Goat Cheese Balls instead. 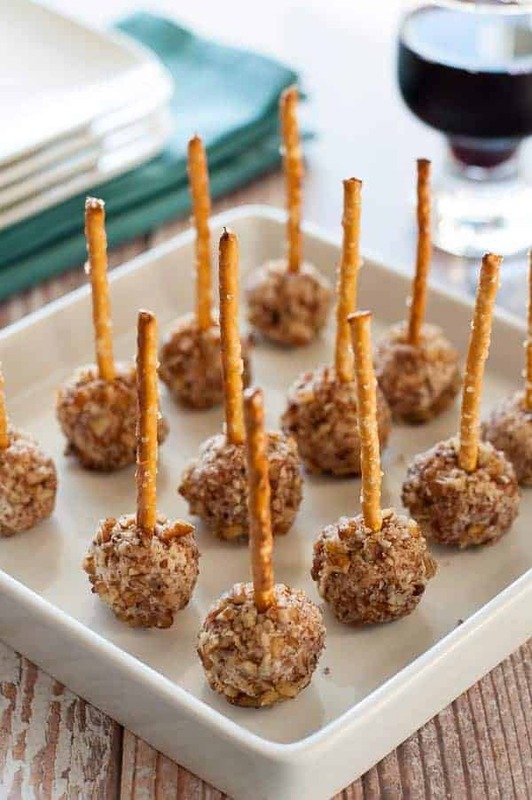 WATCH THIS VIDEO to see just how quickly you can make these fun mini cheese balls on a pretzel stick! Need a last-minute finger food for your party? 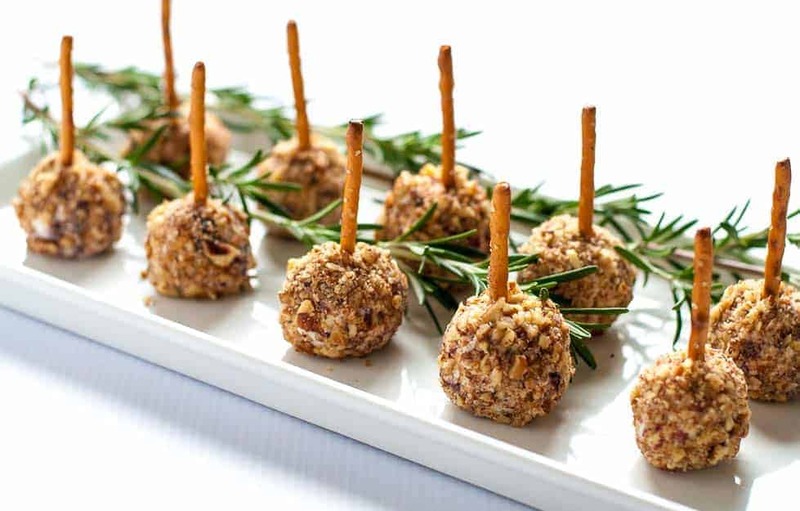 To make these Mini Cheese Balls on a Stick, toss the ingredients in a food processor, form little balls, roll in finely chopped nuts, and skewer with a pretzel or toothpick. Easy! Preheat the oven to 350F. Spread the pecans out on a baking sheet and toast for 7-10 minutes, just until fragrant. Allow to cool, then chop finely in a food processor. Remove and set aside. Clean food processor. Cut the cream cheese into cubes and toss into the food processor bowl. Process until smooth. Add the blue cheese and the cranberries and pulse just until the cranberries are slightly chopped. If you process it too long the cheese mixture will take on an unappetizing blue tinge. Line a baking sheet with parchment paper. Dampen your fingers and roll balls of the cheese mixture about 3/4 to 1 inch in diameter. They should be small enough for a single bite. Roll in the chopped pecans and place on the parchment paper. Chill in the refrigerator for about 2 hours. 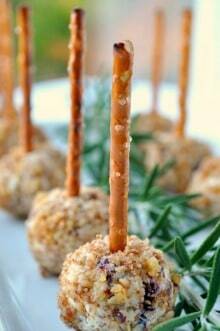 Just before serving, insert a pretzel stick in the middle of each ball. If you insert it too early, it will turn soggy. Make this your own creation! Use cream cheese as a base, but add a different hard cheese. Try adding different dried fruits and nuts, like very finely chopped dried apricots rolled in finely chopped pistachio or pumpkin seeds. 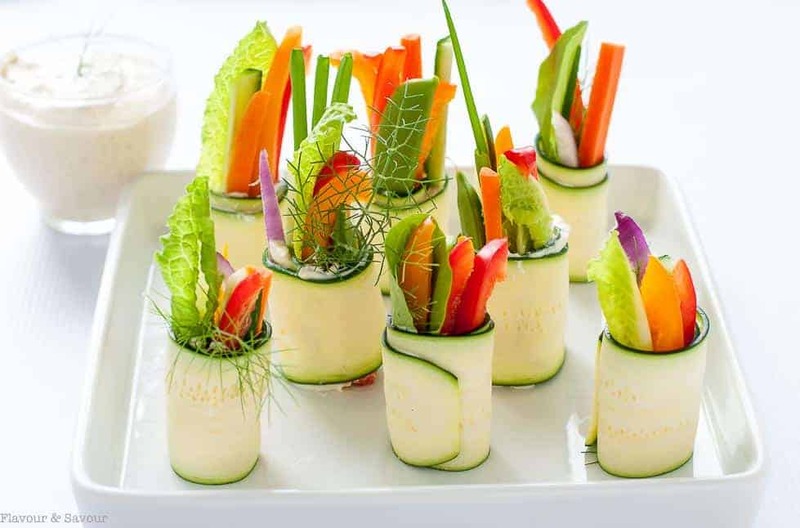 If you like making easy finger foods, you might also like these Fresh Veggie Zucchini Roll-Ups. What we’ll do for that cuteness factor! Love your Sweet Potato Sausage Skewers –on a stick! I found this on Pinterest & decided to make these for a baby shower. Well, in a time crunch at the grocery store (Kroger, to be exact) I found Private Selection Cranberries & Cinnamon Crumbled Goat Cheese (prepackaged & ready to go!) & decided to use it instead. They turned out great & got lots of compliments, especially about how cute they were on the pretzel sticks! I thought they tasted great, too – the cinnamon paired nicely with the tart goat cheese. 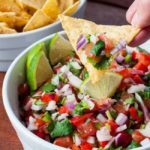 Thank you for the recipe, it’s definitely going in my appetizer rotation! Perfect! That was clever of you to use a shortcut. Great idea–thanks for sharing it with the rest of us. We are addicted now. They are so rich and creamy that I am making the balls in the smaller size. THANK YOU!! Great idea. I like experimenting and using different cheese and nut combinations. Making tiny ones is a smart adaptation! I made these for Thanksgiving yesterday. I followed the recipe, only subbing the blue cheese for smoked cheddar & smoked gouda. It was so good! I loved the creamy texture, and the way the flavors perfectly blended together. I’d always wanted to try making a cheese ball, and these little guys made the process so easy for a first-timer. I’ll definitely be making these again. Thank you! Oh Yum! I love smoked cheese. What a great idea! So glad you liked these. Aren’t they fun to serve? Love these! I am making them for a Masquerade Party tomorrow night for New Years Eve and was wondering if they can be made ahead of time? I would love to be able to make them today and just insert the pretzels tomorrow night before the party! Absolutely! Just keep them refrigerated and, as you said, insert the pretzels just before the party. Happy New Year! What a fun idea! Thanks so much for sharing it. How far in advance can you mix the cheese balls beyond the 2 hours? You could make them a day or two in advance. They keep well in the refrigerator. Over-the-top adorable! Happy Thanksgiving, everyone! Thanks Lizzie! Happy Thanksgiving to you, too! Can these cheeseballs be made ahead and frozen and then defrosted 3-4 days later?? Do you think I could also stuff a grape in them as well? I am having a mardi gras cocktail party and I need to make most stuff ahead of time! Any advice would be appreciated! Yes they can be made ahead, but I wouldn’t bother freezing them. Just keep them tightly wrapped and refrigerated. I’ve never tried them with a grape but it sounds good. Sorry for the delay in responding. Ive been out of wifi range for awhile! Made these yesterday for Thanksgiving. I didn’t use a 2nd cheese, just the cream cheese & regular raisins. I added 1/4 tsp of vanilla and rolled them in crushed pretzels as I was making another thing with nuts. Anyway, they were very popular. A nice bite, with the pretzel stick for additional crunch. I know I will keep this recipe handy and ‘play’ with it at times. Thanks for posting on Pinterest. I love the idea of rolling them in crushed pretzels! Brilliant. Agreed–this is a recipe you can play with and substitute your favourite cheeses and add-ins. Thanks for sharing your ideas for us all! 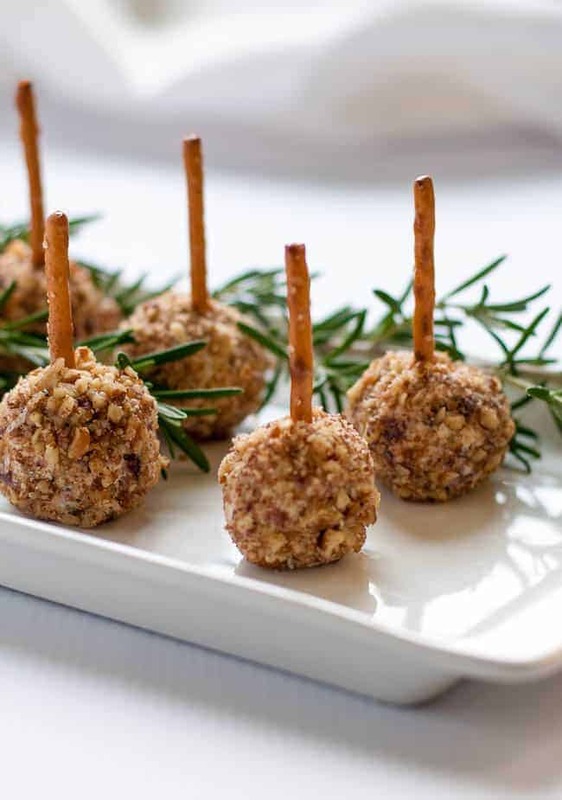 I am thinking about making the mini cheese balls for wedding reception. 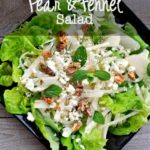 If I make them 2 to 3 days ahead and roll them in pecans, will the pecans get soggy tasting? Hi Mary. These are a great idea for a wedding reception. 3 days might be a bit too far ahead. You could, however, make the balls ahead of time, refrigerate them and then roll them in the pecans the day before. Just remember to put the pretzel in closer to serving time because it WILL get soggy. I want to make these for a party which is about 30 minutes away from my home. Will they be good if I chill them completely at home and then serve them at room temperature after driving to the party? Yes, they should be fine! I would suggest putting the pretzel sticks in once you arrive. Happy holidays! This is one of my go-to recipes every time there’s a party or special occasion. Everyone loves these and they’re so cute—and easy! Just thought I should let you know. Thanks!